Thousands Shocked – Hundreds Volunteer. 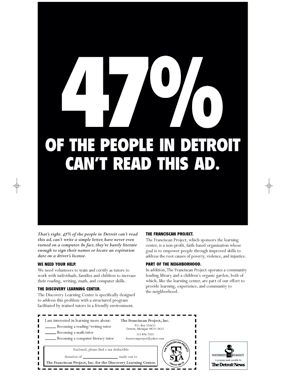 This was a newspaper ad done under the “The Detroit News — Partnership for Humanity” program. The program pairs agencies and small community services organizations that do not receive media attention like the bigger ones. The goal is to create ads that would run in The Detroit News and The Detroit Free Press that would inform people of these unique community services. The Franciscan Project is comprised of a group of Catholic nuns who moved to inner city Detroit to promote literacy. The program is very successful and has impacted many families. The ad created quite a stir in the media when it ran, due in part to the attention it drew to illiteracy numbers in Detroit. The ad was a great success, and the project enjoyed a surplus of volunteers.